The mockumentary style of film has been around for several years now and we have seen areas from heavy metal music to dog shows. 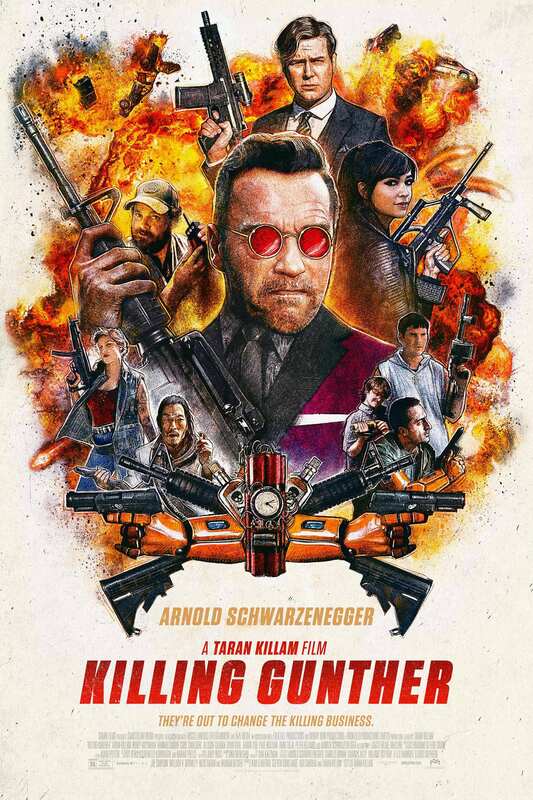 You can now add hitmen to the list of topics covered with the new Taran Killam film, Killing Gunther. Blake (Taran Killam) assembled a crew of young, up-and-coming hired assassins to help him kill the “white whale” of contract killers, Gunther. Problem was that no one knew who Gunther was or what he looked like. So, kidnapping a camera crew, Blake insists that they film everything as they attempt to take the place at the top of the heap by killing Gunther. There are some definitely fun things going on in this mockumentary. A very strong cast helps to give the film its needed gravitas as this group of assassins find themselves one step behind Gunther at every turn. In the most intriguing casting of the film, Arnold Schwarzenegger played the role of Gunther, and, though we do not get much in way of screen time from Arnold, he is clearly having a great time hamming it up and chewing every last bit of scenery in the scenes that he does find himself in. There are also some good side characters, especially Donnie (Bobby Moynihan of SNL fame), who is an explosion expert and Aaron Yoo as poison expert Yong. Cobie Smulders appears as one of Blake’s former flames, Lisa. Though there is fun to be had, it does feel like the concept is stretched a little thin. It is as if it would have been a great short film or perhaps a great sketch on SNL, but for a whole 90+ movie, it did feel a tad dragged out. The ending is a cop out and I wished they would have stuck with what appeared to be the original ending. Still, there are good enough moments of humor and satire to recommend this film. Seeing Arnold Schwarzenegger in the role makes everything worthwhile. Just know that Arnold does not arrive until later in the film so you are not disappointed.